and how does it affect beach access in Fairfield? The doctrine limits public and private use of tidelands and other shorelands in order to protect the public's right to use the waters of the state. The doctrine has been legally interpreted to support use of the intertidal zone (see below) for relief from the pressures of life in modern society, and the parallel enjoyment of nature’s beauty. Protection of the trust is a duty of the state, and as such, Connecticut’s government is required to maintain it for reasonable use by the public. The Public Trust Doctrine does not allow the public to trespass over privately owned uplands to access the tidelands. It does, however, protect public use of navigable water bodies below the “ordinary high water mark” (OHWM). Put another way, this area, as a natural resource, is analogous to a “public highway” that, given upland access, any citizen of the state may transverse laterally. So WHAT IS the public trust area? 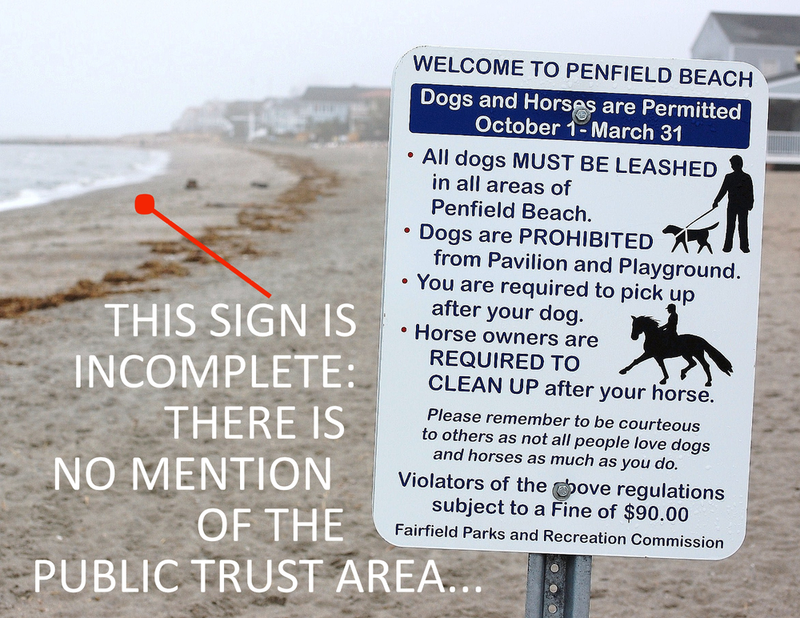 At Fairfield beaches, once upland access is granted (that is: between October 1 and March 31, when dogs and horses are permitted to accompany “responsible persons” pursuant to §14 of the Fairfield Parks & Recreation Commission Rules and Regulations: Beaches), it is reasonable to interpret that a person may walk with their dog OFF-leash while within this “Public Trust area,” or more simply, below the OHWM. The Public Trust area is also sometimes referred to as tidelands or tidal flats, and is defined as “public beach” by The Connecticut Coastal Management Act, CGS 22a-93(6). Put another way, this area, as a natural resource, is analogous to a “public highway” that—given upland access—any citizen of the state may transverse laterally. The mean or average high water mark is commonly interpreted as merely the “high water mark” as a matter of legal or administrative practicality/convenience (as it is in signage at Fairfield beaches); but it is important to understand the term more particularly. The Mean/Ordinary High Water Mark (MHWM or OHWM) is the average of all the high water marks observed over a period of years. In the US, this period spans 19 years (an epoch) and is referred to as the National Tidal Datum Epoch (NTDE). WHAT IS a "Tidal Datum"? NOAA graphic: tidal datum (see also: footnote #7 on our tide calendar page for further explanation). A datum is a reference elevation of the sea surface from which vertical measurements are made, such as depths of the ocean and heights of the land. The intersection of the elevation of a tidal datum with the sloping shore forms a line used as a horizontal boundary. In turn, this line is also a reference from which horizontal measurements are made for the construction of additional coastal and marine boundaries. A tidal datum is the vertical reference based on a phase of the tide. Standardization is necessary because of periodic and apparent secular trends in sea level. The present NTDE is 1983 through 2001 and is actively considered for revision every 20-25 years. The mean high water is the mean (average) of all high water heights observed during current NTDE. The wrack line (or tidal wrack), marks the “fluctuations of tidewaters” delineating the OHWM, and is the line of dead or dying seaweed, marsh grass and other debris (including litter) left on the upper beach by the preceding high tide. Below this line: is the Public Trust area. There may be other lines of wrack higher up, created by former spring or storm tides, but the lowest line will often tell you the limit of the last high tide (see illustration, below), except if that tide does not wash away earlier wrack. Wrack from an unusual or seasonal storm or hurricane is not generally regarded as representative, because it is not factored into calculating the datum. In this instance or in unseasonably warm weather, when the beach may be crowded, asserting your (off-leash or otherwise) right to this area may become problematic. To avoid an infraction, if in question, a conservative judgement is practical: our monthly tide calendar can provide guidance. Then… who holds responsibility for law enforcement within the public trust area? As public property that is under stewardship of the State, Connecticut State Police hold primary jurisdiction within the public trust area. The practicality, however, of anticipating State Police to present themselves (especially at the moment of importance) is obviously problematic. Upon a complaint, Town of Fairfield Police may therefore request permission (direction) of the State Police to intervene on their behalf, and this would likely be considered as an ordinarily accepted agreement. For this reason, it would seem plainly wrong to assume that Fairfield Police have “no jurisdiction” to act within the public trust area. Further, it should be expected that broad leeway would be agreeable to both for interpreting how local and state interests and regulations would overlap and compete, given the contiguous and changing nature of the local/public (state) trust boundary. Indeed, an emergent situation may involve interests (and jurisdiction) of both. Clearly, however, it is the local authorities who are logically able to respond most immediately. If, for example, a person were within the public trust area but conducting themselves in a manner which would ordinarily violate state public nuisance definitions, local Fairfield ordinances (examples: littering, intoxication, or engaging in behavior typical of “disorderly conduct;” or, in a manner that endangered the safety, well being, or property of others—on either or both sides of the trust area); or, behavior commonly recognized as “public nuisance,” Fairfield Police may clearly expect not only permission but direction from CT State Police to intercede on their behalf. More logically, a standing agreement to accommodate this ongoing need would already be in place. The US Supreme Court issued its landmark opinion on the nature of a state’s title to its tide and submerged lands over 100 years ago: Illinois Central R.R. Co. v. Illinois (1892) 146 U.S. 387, 452. The dispute arose over the title of lands occupied by the Illinois Central Railroad Company's tracks, stations, piers, & other constructions along the Chicago lake front. In fact, the legislature had given the railroad company (a private corporation) title including the bed of Lake Michigan, however, the State argued that it held original ownership & control of those submerged lands. The Court held that the legislature could not divest the State of its ownership, control, and responsibility for management of these regions; and that the government was required to preserve them for public use. As discussed in the subsequent pages of this essay, various legislatures and the courts have examined and re-evaluated the parameters of tidelands trust issues since then, however, the basic premise of the trust remains fundamentally unchanged: the Court affirmed that a state’s title to its tidal and submerged lands differs from title to lands it holds for sale. The Public Trust, therefore, is an affirmation of the duty of the state to protect the people’s common heritage of tide and submerged lands for their common use: “… It is a title held in trust for the people of the State that they may enjoy the navigation of the waters, carry on commerce over them, and have liberty of fishing,” that is, unencumbered from obstruction, or interference from private parties. For this discussion, common law refers to laws and the parallel legal system that is developed through court decisions (case law), rather than through legislative or executive action. As such, the decision in a currently pending legal dispute is dependent on decisions in similarly themed cases that have already been resolved; and in turn, it affects the law to be applied in future cases. When there is no authoritative statement of the law, judges have the authority and duty to interpret and apply (create) law, and by so doing, develop precedent for future cases. The mass of precedent (called: common law) binds future decisions, such that the parties and judges must follow the reasoning used in the prior decision (stare decisis, or “to stand by the decision”). If the current dispute is fundamentally dissimilar to those already adjudicated (a “matter of first impression”), the court’s new decision becomes binding precedent which is used to resolve future cases. CT Department of Energy & Environmental Protection: The Public Trust: What are the public's rights along Connecticut's shore? The definition of “navigable waters” is set forth in Title 33 CFR (Code of Federal Regulations) Part 328.3, Definition of Waters of the United States. Federal jurisdiction over non-tidal navigable waters is established in: 33 CFR Section 329.11(a)(1), and utilized by USACE to administer the R&HAA and CWA regulatory programs; (see note #5, below). Approved by the National Oceanic and Atmospheric Administration, Connecticut's Coastal Management Program is administered by the DEEP under the 1972 Federal Coastal Zone Management Act (CZMA: P.L. 92-583). Enacted in 1980, the Connecticut Coastal Management Act (CCMA) codifies through statute a program to ensure neutral growth along the coast, improve public use and access, protect water-dependent uses, public trust waters and submerged lands, restore coastal habitats, promote harbor management, and facilitate research. The Coastal Management Program also regulates work in tidal, coastal and navigable waters and tidal wetlands under the CCMA; development of the shoreline is regulated at the local level through municipal planning and the zoning boards and commissions, provided technical assistance and oversight by program staff ensuring compliance with policies of the CCMA. Among other applications, the U.S. Army Corps of Engineers (USACE) establishes the OHWM as a jurisdictional benchmark for administering its regulatory program in navigable waterways pursuant to §10 of the Rivers and Harbors Appropriations Act of 1899 and §404 of the Clean Water Act. (15) change in plant community. Further stipulated as other (but not limited to) reliable methods that may be indicative of the OHWM include: (A) lake and stream gage data, (B) elevation data, (C) spillway height, D) flood predictions, (E) historic records of water flow, and (F) statistical evidence. The Agency does discuss that these should include “characteristics associated with ordinary high water events, which occur on a regular or frequent basis. Evidence resulting from extraordinary events, including major flooding and storm surges, is not indicative of the OHWM. For instance, a litter or wrack line resulting from a 200-year flood event would in most cases not be considered evidence of an OHWM” (USACE Regulatory Guidance Letter: 07 December 2005). She would come back, dripping thick water, from the green bog. We did not think of music, but anyway, it began to rain slowly. Her wolfish, invitational half pounce. Her great and lordly satisfaction at having chased something. swiping my face with her wild, slightly mossy tongue. Does the hummingbird think he himself invented his crimson throat? He is wiser than that, I think. Do the cranes crying out in the high clouds think it is all their own music? or the laws which pertain to them. think that all by herself she has imagined the refuge and the refreshment of her long slumber? that you know almost nothing. is a palace of his own making? She roved ahead of me through the fields, yet would come back, or wait for me, or be somewhere. Nor will I argue it, or pray for anything but modesty, and not get angry. Through the trees there is the sound of the wind, palavering. The smell of the pine needles, what is it but a taste of the infallible energies? How strong was her black body! Finally, the slick mountains of love break over us.